The start of the year has been momentous for Vans to say the least, they’ve been celebrating their 50th Anniversary with a string of special releases, dropping some cream-of-the-crop collaborations with the likes of Supreme and F.O.G and they’ve gained some unexpected internet shine. Continuing with that momentum Vans are debuting a new signature footwear and apparel line with Thrasher’s 'Skater of The Year (2015)', Anthony Van Engelen which will be out later this month. As an influential leader in today’s skating scene Anthony Van Engelen expresses timeless style and performance and this is evident in his upcoming collection. His signature AV Rapidweld Pro sneaker features a stitchless Rapidweld shell with a welded DURACAP for upper reinforcement. The model offers a minimalist tech approach whilst maintaining the integral performance results in its construction and design. Additionally, the LUXLINER inner glove component is added for enhanced comfort and is built atop Van’s trademarked PRO outsole. Accompanying the AV Rapidweld is a full line of apparel and accessories, and just like the sneaker the devil is in the detail as it comes with some subtle technical features. 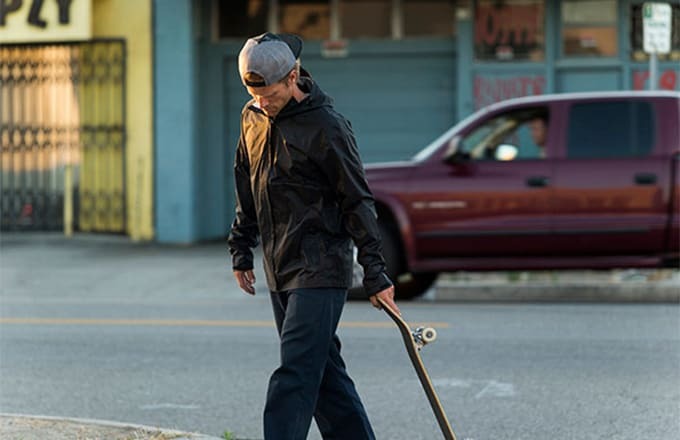 The standout piece is the AV Holser windbreaker jacket, which is draped in stealth black nylon ripstop, water-resistant microporous coating, critically taped seams and underarm vents. Van’s Anthony Va Engelen collection will be available from March 12 from the Vans webstore. For a full look at the signature collection check out our gallery below.